A couple of weeks ago, I was able to have dinner with Anna when she visited Virginia Beach, VA. She and David had wanted to get away from the mountains for a brief break at the ocean. 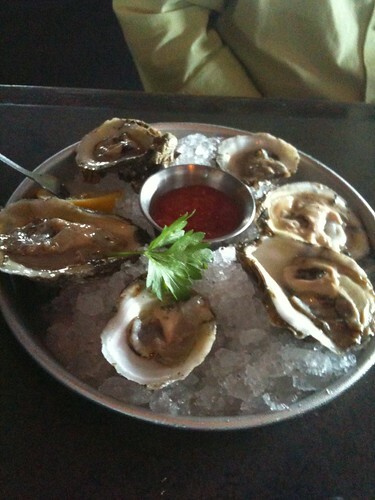 When they requested a great place for seafood, we ate at my favorite restaurant, Mahi Mah’s in the Ramada on 6th Street. Not only known for their seafood and sushi bar, the restaurant has an incredible wine list which would make any sommelier drool. We toasted to her teaching at STITCHES East ETC with freshly shucked oysters harvested from the James River, sipped a lovely bubbly, ate wonderfully prepared meals, and enjoyed the desserts brought to us by our server Sean. Later we strolled in the sand along the Atlantic ocean and managed to play in the water as the sun settled down for the night. It was an evening to remember. Seeing Anna and David made me realize how much I missed being in Blacksburg and all the friends that are still there. While we chatted about the comings and goings in the fiber industry, it was no surprise that the topics of Sock Summit and STITCHES East ETC appeared. Anna was teaching at both, and was planning on being at Greensboro, NC in September. When asked who was representing XRX for Sock Summit, I had to reply, “Benjamin, of course. As CEO he is Mr. XRX.” We giggled as we envisioned the celebration of all things socks occurring that weekend. Little did I know how much I would pine to be there now with my friends. To console myself, I have been checking the calendar to assure myself that the date and time for the next event I will be at is still the same: Thursday, August 25th at 10AM. I check the Ravelry boards and see if there are any updates on Facebook. Nope, we are still on schedule. Being mindful that I am not waiting for winter to appear, I am anticipating Jean Frost’s Speech for STITCHES Midwest’s Opening Day! 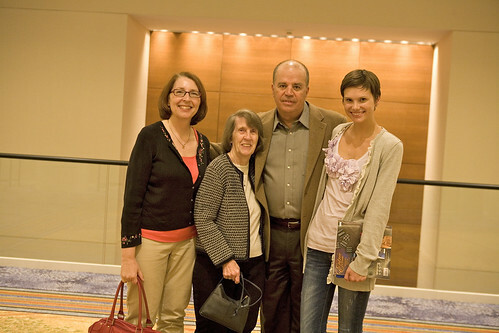 Below is a quick photo taken of Jean, her daughter, Alexis, and Nadia at STITCHES Midwest last year. So if you are like me and anticipating seeing friends, start marking your calendars. I see a lot of events in our future!